Artisan Crafted Soapstone and Cat's Eye Beaded Earrings, "Ayeyi Nka Boafo"
From Ghana's Rachel Armah, these artisan crafted earrings exude African elegance. 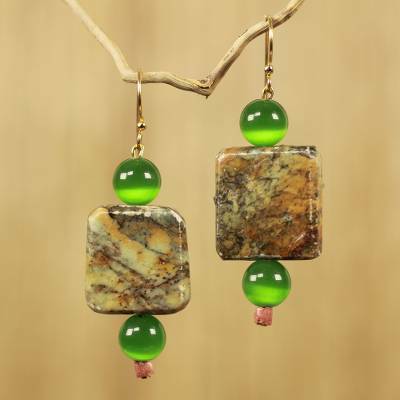 Natural soapstone squares are flanked by dazzling cat's eye beads enhanced to an intense green hue. Armah calls this design "Ayeyi Nka Boafo," an Akan phrase meaning "praises to the helper." Adorned with bauxite beads, the earrings are worn on brass hooks. Rachel Armah has received 3 microcredit loans with 0% interest from Kiva and Novica, the first for $100 and the most recent for $150. Proceeds were used to stock up on beads and stones for her jewelry. The necklace is beautiful. I receive many compliments and inquiries as to where the necklace came from.